We just rolled in some changes to adjust how we handle average sales / day calculations for events with zero sales on days you expect to have them. Currently if a date is between the start/end date of an event AND there are no sales, ZenShows will assume that you were not at the location that day (holiday, or you just decided to skip that day). However, if you expected sales and there were none, then this can throw off the average sales per day calculations as that day is not include. Now you can override this by clicking on the date in your results tab on the event. 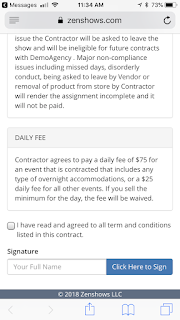 This will insert a flag that makes that day count in the total days sold at that event even if there were no sales. Check it out on your events tab. Click on the date with no sales to toggle this on and off.